The Jokela school shooting occurred on 7 November 2007, at Jokela High School in Jokela, a town in the municipality of Tuusula, Finland. The gunman, 18-year-old student Pekka-Eric Auvinen, entered the school on that morning armed with a semi-automatic pistol. He killed eight people and wounded one person in the toe before shooting himself in the head; twelve others were also injured by flying shattered glass or sprained ankles. Auvinen died later that evening in a Helsinki hospital. 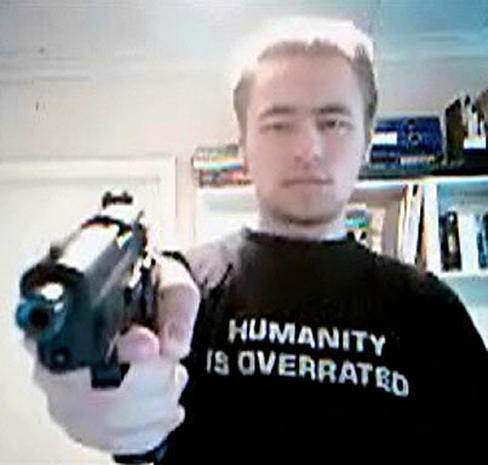 This was the second school shooting in the history of Finland. The previous incident occurred in 1989 at the Raumanmeri school in Rauma, when a 14-year-old fatally shot two fellow students. Less than one year after the Jokela school massacre, the Kauhajoki school shooting occurred in Kauhajoki, where a gunman shot and killed ten people before killing himself. "The sounder your argument, the more satisfaction you get out of it." This entry was posted in Uncategorized and tagged 2007, 7 November, Jokela school shooting by admin. Bookmark the permalink.